I’ll admit I’m not a Hello Kitty fanatic, but I know a lot of people are. I don’t totally get it but it’s just a fact I’ve stopped questioning, like why some people tolerate or even like mayonnaise. Anyway, yummy Ladurée just came out with limited-edition Hello Kitty macarons (though they aren’t even shaped like Hello Kitty, it’s just the packaging). Anyway, I found out about them because all these people started Instagramming pictures of the boxes, so obvs they’re all the rage. 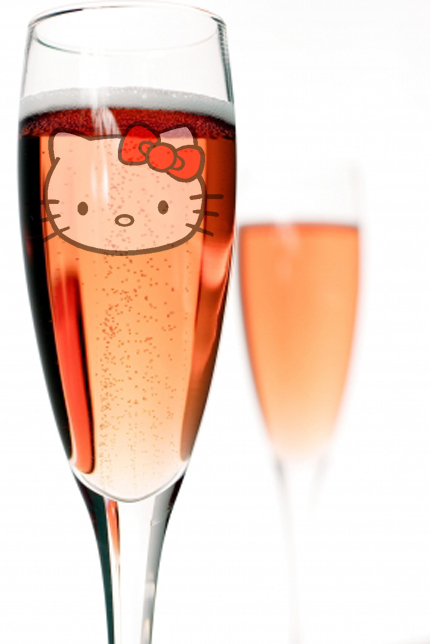 However, did you know Hello Kitty also makes wine??? Two years ago they came out with four different kinds – a red, a white and two sparklers. Seems kind of odd, right – Hello Kitty and alcohol? The marketer for the wines said that Sanrio now thinks of the Hello Kitty brand as “being somewhat mature at this stage and open to all kinds of product interpretations.” I’ll say! When I was 8 all I had was a pack of multi-colored mini-pencils, and couldn’t use them to draw all over wine labels. They’re not even that cheap – ranging from $18 to $35. But when you have Swarovski Hello Kitty figurines going for $25,000 on ebay, they’re a bargain. Tags: hello kitty, laduree, macaron, pinot noir, sparkling, wine. Bookmark the permalink.